There are various venues to discover on the University campus - the Hunterian Museum, Hunterian Art Gallery, home to The Mackintosh House, the Zoology Museum and the Anatomy Museum. William Hunter’s original collection was assembled to improve knowledge of the world and was rich in rare and important objects. 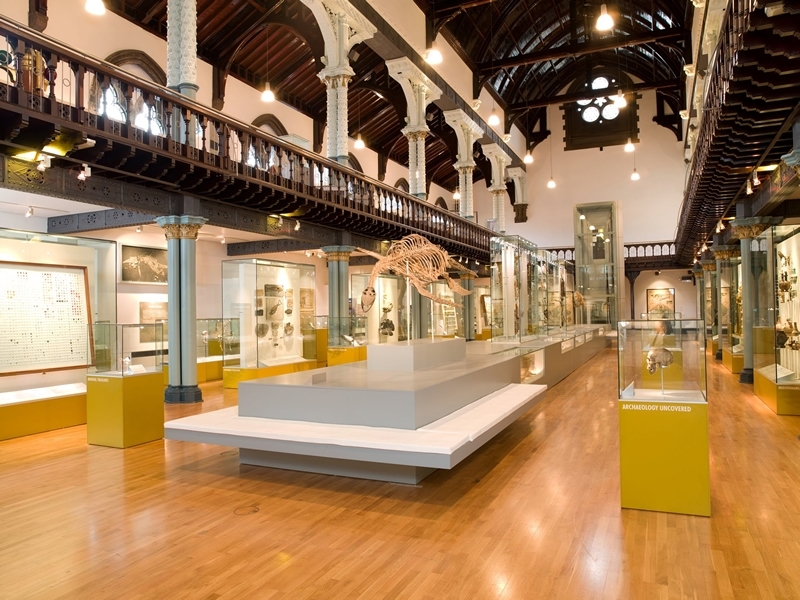 Some 200 years later, the recently refurbished Hunterian Museum contains a huge variety of objects and offers the chance to discover and explore. You will encounter architects and builders from the animal kingdom and unearth a fascinating variety of Scottish fossils and minerals. The past can be reconstructed by investigating how archaeology works and learning about Mediterranean history, from Ancient Egypt to Greece and Rome. You can also discover dinosaurs and explore 500 million years of evolution, from fin to limb and limb to wing, journey around the globe exploring unique societies and cultures, or experience the breathtaking range of life on Earth from insects to birds and coral. In 1807, the Hunterian was the first museum in Britain with a gallery of paintings. Today, although most famous for our Whistler and Mackintosh collections, we have a wide range of outstanding works on show. See masterpieces by Rembrandt, Rubens, Chardin and Stubbs, and the world’s largest permanent display of the work of James McNeill Whistler. Examine the significant Scottish Colourist collection, or explore the distinctive style of the Glasgow Boys and Girls. Discover the largest single holding of the work of Charles Rennie Mackintosh and The Mackintosh House, the reassembled interiors from his Glasgow home. The Mackintosh House comprises the meticulously reassembled interiors from the house occupied by Charles Rennie Mackintosh and his artist-wife Margaret Macdonald from 1906 to 1914. The interiors are furnished with Mackintosh's original furniture and fitments and decorated as closely as was possible to the original. The House presents the personal setting of this remarkable artist-couple and provides an impressive example of the concept of the 'room as a work of art'. You can also see works on paper in The Print Room. In this part of the Hunterian you will see displays on the astonishing diversity of the animal kingdom. There are familiar animals you may recognise - a 'cuddly' koala in the marsupial display or antelopes herding in the middle of the gallery. There are also less familiar creatures, sponges that look like glass ornaments, worms that live in the gut of a horse and microscopic marine animals. With almost two million animal species described so far (and many more to discover) we can only hope to give our visitors a taste of the range of animal variety. Perhaps unexpectedly, the Hunterian Zoology Museum also maintains displays of live animals. A small selection of snakes, lizards, frogs and invertebrates are on show. Our bearded dragons, large spiky sandy-coloured lizards from Australia, greet visitors as they arrive at the Museum! William Hunter’s remarkable specimens show all aspects of human form and function and reflect his lifelong successful career as a pioneering anatomist and obstetrician. Largely used for teaching and research, the collections have considerable importance in the history and development of medicine.